A perfect dessert for a dinner party because you can make it ahead and who doesn’t love creamy chocolate? The cream in this gives it an extra richness that puts it over the top in deliciousness, but it’s still light enough to enjoy without being done in by richness. A word about chocolate before I give the ingredients. There are so many types of chocolate that it can be hard to choose. My personal philosophy on this is that when chocolate is the star of the show, use the best chocolate you can find. I love Scharffen Berger and think it’s worth the extra cost for a dessert like this. Put chocolate in a stainless steel bowl set over a saucepan with about 2 inches of barely simmering water. As soon as you put in the chocolate, turn off the heat. Melt the chocolate, stirring the whole time. When chocolate is melted, remove bowl from heat and whisk in the butter 1 tbsp at a time. It should melt without putting it back on the hot water, but you can put it back if needed. Then, stir in salt, vanilla, and coffee or liquor. Next, whisk in the eggs one yolk at a time.You want to be careful here, because if the chocolate gets too hot, it can separate from the butter and eggs and this is not fun. This happened to me after I added the last egg yolk and I had a lumpy mess with melted butter on top of the chocolate. I had to run to the store and start over. I kept the bowl off the hot water as soon as the chocolate was melted and did all the rest on the counter. It still got a little grainy looking and not smooth as pudding after the last yolk was added, but I was NOT starting over again, so I carried on adding the whipped egg whites and it smoothed out nicely. So, don’t worry if it’s not completely smooth after adding the yolks. Beat egg whites on medium speed until soft peaks form. Raise speed to high and slowly add the sugar. Keep beating until soft peaks form again. Whisk a quarter of the whites into the chocolate to lighten it, then gently fold in the rest of the whites. Whip cream to soft peaks, then gently fold into mousse. 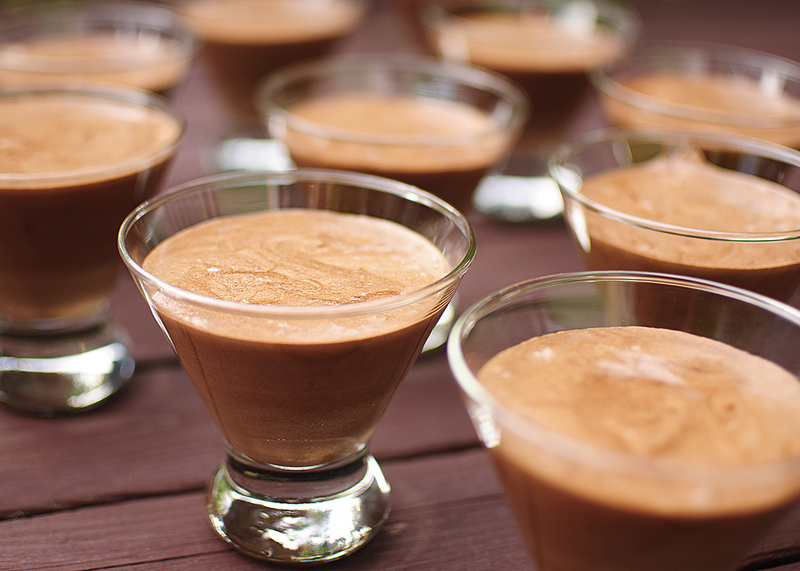 Spoon mousse into 6 to 8 individual serving dishes or glasses. I used the short cocktail glasses you can see in the photo and these were perfect. $2.50 at Crate and Barrel and they can have another life holding your Cosmopolitan! Cover and refrigerate at least 2 hours and as long as 24 hours. 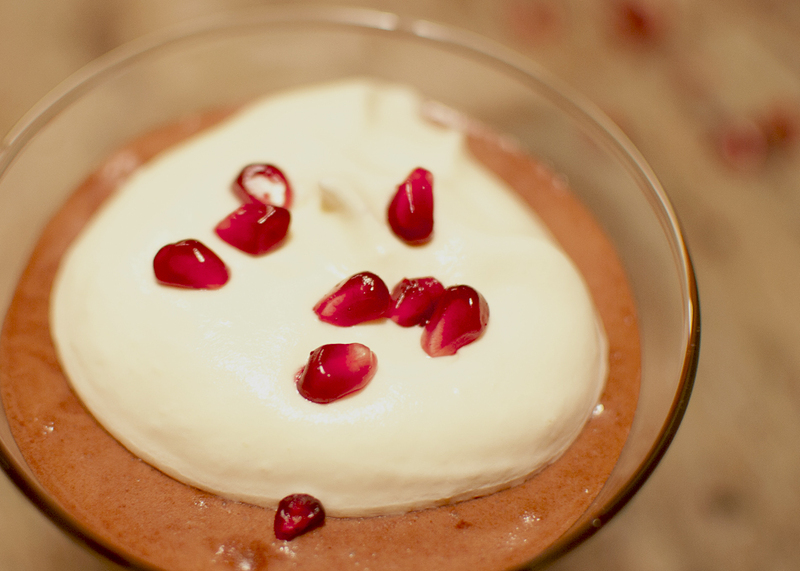 Serve topped with a little more whipped cream and garnish with chocolate curls or pomegranate seeds as shown below. This entry was posted in desserts and tagged chocolate.